VANCOUVER , Jan. 28, 2019 /CNW/ - IsoEnergy Ltd. ("IsoEnergy" or the "Company") (TSXV: ISO; OTCQX: ISENF) is pleased to announce that it has intersected intervals of strong (>20,000 total cps on an RS-125 hand-held spectrometer) uranium mineralization at the Hurricane zone in the first two drill holes following-up last summer's intersection in drill hole LE18-01A. 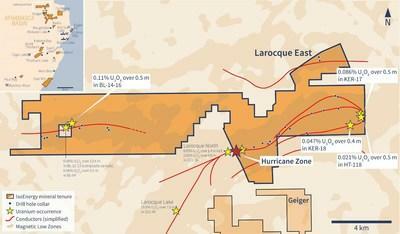 The Hurricane zone is a new discovery of high-grade uranium mineralization on the Company's 100% owned Larocque East property in the eastern Athabasca Basin of northern Saskatchewan. Craig Parry , Chief Executive Officer commented: "I'm pleased to announce this very successful start to follow-up drilling at our Hurricane Zone discovery in the prolific Eastern Athabasca Basin of Saskatchewan. With the uranium price continuing to show strength and catalysts for rising prices continuing to develop we are in an ideal position – drilling high-grade uranium in an environment of improving market conditions." Steve Blower , Vice President of Exploration commented: "The uranium intersections in drill holes LE19-02 and LE19-03 demonstrate that the Hurricane zone is continuous across at least three drill holes on the discovery section and is at least 25 metres wide, with much room for growth. We will continue to systematically evaluate the potential for expansion with additional step-outs on this section followed by drilling along-strike." Drill hole LE19-02 was designed to evaluate the potential for expansion of the Hurricane zone 12.5 metres north of the discovery drill hole LE18-01A. After penetrating 44 metres of overburden, drill hole LE19-02 cored Athabasca sandstone to 329 metres and then basement metasedimentary gneiss to the end of the hole at 425 metres. Substantial uranium mineralization was intersected in the drill hole, demonstrating that the zone extends at least 12.5 metres to the north of LE18-01A. The radioactive intervals (>1000 total cps on an RS-125 hand-held spectrometer) are summarized in Table 1 and are shown on a cross section in Figure 2. They include a 2.0-metre-long zone of uranium mineralization perched in the sandstone and centered about 10 metres above the unconformity, and a 3.5-metre-long zone of uranium mineralization that straddles the sub- Athabasca unconformity. Mineralization includes fracture controlled and disseminated pitchblende with hematite and clay. Within the lower interval is a 1.5-metre-long subinterval of strong radioactivity from 328.5-330.0 metres that measures >20,000 cps on the RS-125. Within the 1.5-metre-long subinterval is a 0.5-metre-long zone of dark grey to black semi-massive uranium mineralization that measures >50,000 cps (RS-125). Basement rocks immediately beneath the mineralization consist of bleached and clay-rich graphitic cordierite augen gneiss with two major fault zones that correlate well with large cataclasite faults intersected in drill hole LE18-01A. Designed to evaluate the potential for expansion of the Hurricane zone 12.5 metres south of the discovery intersection, drill hole LE19-03 penetrated similar lengths of overburden and Athabasca sandstone as drill hole LE19-02, described above. LE19-03 also intersected substantial amounts of uranium mineralization comprised of two intervals that are listed in Table 1 and are shown on Figure 2. These include a 3.0 metre intersection immediately above the sub- Athabasca unconformity that correlates with the main intersections in drill holes LE18-01A and LE19-02 and includes a 0.5-metre-long interval of strong radioactivity at the base of the intersection that measures >20,000 cps (RS-125). These results demonstrate that the Hurricane zone extends at least 12.5 metres south of drill hole LE18-01A and has a minimum width on this cross-section of 25 metres. Larocque East consists of 6 mineral claims totaling 3,200 hectares and was recently purchased in May, 2018. The Property is owned 100% by IsoEnergy and is not encumbered by any royalties or other interests. Larocque East is immediately adjacent to the north end of IsoEnergy's Geiger property and is 35 kilometres northwest of Orano Canada's McClean Lake uranium mine and mill. The Property covers a 15-kilometre-long northeast extension of the Larocque Lake conductor system; a trend of graphitic metasedimentary basement rocks that is associated with significant uranium mineralization in several occurrences to the southwest of the Larocque East property. The closest of these are Cameco's Larocque Lake and Larocque North zones, which are located 6.5 kilometres and 0.4 kilometres, respectively, to the southwest of the western Larocque East property boundary. Drilling at the Larocque Lake zone has returned historic intersections of up to 29.9% U3O8 over 7.0 metres in drill hole Q22-040. Drilling at the Larocque North zone has returned intersections of up to 2.05% U3O8 over 0.8 metres in drill hole Q22-16. Like the nearby Geiger property, Larocque East is located adjacent to the Wollaston-Mudjatik transition zone - a major crustal suture related to most of the major uranium deposits in the eastern Athabasca Basin. Importantly, the sandstone cover is thin, ranging between 140 metres and 330 metres in previous drilling. The scientific and technical information contained in this news release was prepared by Steve Blower , P.Geo., IsoEnergy's Vice President, Exploration, who is a "qualified person" (as defined in National Instrument 43-101 – Standards of Disclosure for Mineral Projects). Mr. Blower has verified the data disclosed. This news release refers to properties other than those in which the Company has an interest. Mineralization on those other properties is not necessarily indicative of mineralization on the Company's properties. An RS-125 hand-held spectrometer was used to verify that the radioactivity is due to uranium. As drill holes LE19-02 and LE19-03 were drilled vertically and the mineralization is interpreted to be horizontal, the true thickness is expected to equal the cored intervals.